Jose Pedraza dethroned WBO lightweight champion Raymundo Beltran, and WBO super bantamweight champion Isaac Dogboe crushed Hidenori Otake (31-3-3, 14 KOs) by a 1st round knockout on Top Rank Boxing on ESPN+ on Saturday night at the Gila River Arena in Glendale, Arizona. Unfortunately, the two top fights on the card failed to live up to expectations from the fans. In the main event, Jose ‘Sniper’ Pedraza (25-1, 12 KOs) used his jab, movement and nice pot shots to pound out a 12 round unanimous decision by the scores 114-112, 117-110 and 117-110. The 117-110 score was a fair one for the fight. Pedraza appeared to win at least eight rounds in the fight. 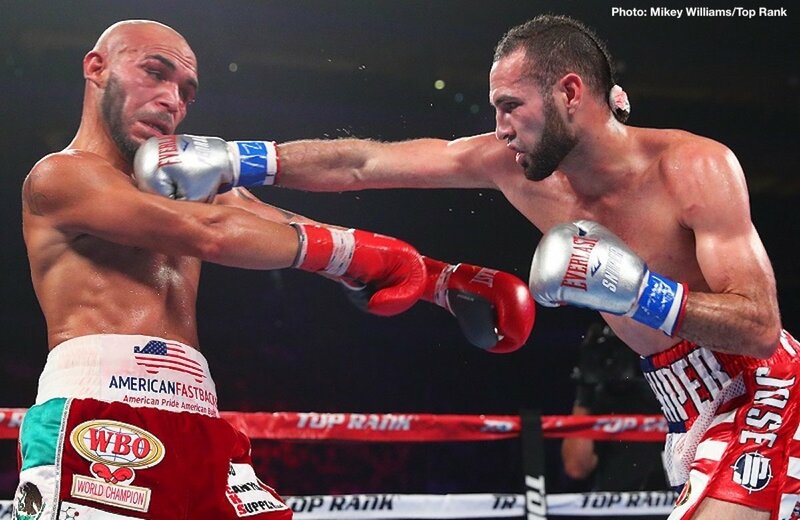 Pedraza knocked Beltran, 37, down in the 11th round from a beautiful left uppercut. It was great for Beltran to get back on his feet and try and finish out the round without getting stopped. Beltran was dealing with a bad cut that he suffered early in the fight that hampered his vision. He still kept coming forward, but he wasn’t able to land enough shots for him to have a chance of winning the fight. The speed and boxing skills difference between the two fighters was too much for Beltran to have a chance of pulling the fight off. Top Rank should have known that Beltran wasn’t going to win the fight against a fighter with Pedraza’s talent. The loss for Beltran was a disappointing one for sure, as if he had won, he would have gotten a career high payday in facing fellow Top Rank fighter Vasyl Lomachenko in a unification fight in December. Top Rank promoter Bob Arum has been talking about wanting to make the unification fight involving two of his fighters. It now won’t be Beltran that will be facing Lomachenko. It’s going to be Pedraza, and that should make it a little tougher for Lomachenko than if he had Beltran as an opponent. Pedraza had held the IBF super featherweight title in 2017, but he lost it to Gervonta Davis by a 7th round knockout. Pedraza has now won his last three fights since the Davis fight. In other action on the card, World Boxing Organization super bantamweight champion Isaac Dogboe (20-0, 14 KOs) registered his 20th career win in beating Hidenori Otake (31-3-3, 14 KOs) by a 1st round knockout. Dogboe knocked Otake down twice in the 1st. The referee stopped the fight moments after the second knockdown. Dogboe was hurting Otake with every shot. The bout was called off at 2:18 of round 1. Dogboe needs to be fighting better opposition than this if they want to build up his popularity. It’s no good if Dogboe is put in with opponents that are completely over-matched like Otake. This fight was embarrassingly one-sided. Otake looked like a hopeless journeyman who had wondered into the wrong ring by mistake. Dogboe’s management isn’t doing him any favors by putting him in with mediocre old timers like Otake.